Apr 10 Detective Comics: Who is the Arkham Knight? Anyway, the identity of the Knight is a mystery, but there are several interesting clues already, so join me, fellow detectives, as we work, issue-by-issue, to uncover the identity of this mysterious new foe! Warning: we’ll be spoiling any and everything that the Arkham Knight has appeared in, including whichever issue of Detective Comics is in stores at the time you’re reading this. Proceed at your own risk. The Arkham Knight—at least in name and general aesthetics—was created by game developer Rocksteady, for the final installment in their Batman trilogy, Batman: Arkham Knight. It didn’t take much time with the game for longtime Batfans to figure out that the game’s title character was Jason Todd, the second Robin. In the Arkham-verse, he was merely thought to have been killed by the Joker, when in fact the Clown Prince had only psychologically and physically tortured him over a prolonged period of time. In true Red Hood fashion, the Arkham Knight showed up out of nowhere, made Batman’s life very difficult, let Bruce know that he knew his identity, and whined ceaselessly in their final confrontation. At that point, he was in full Todd-mode, criticizing Bruce for stopping short of dispensing terminal justice to the violent criminals in Gotham. Is the Arkham Knight in Detective Comics Jason Todd? No. DC—maybe even Tomasi himself—has said as much; but, even if you’ve been rendered cynical my some of the publisher’s misdirection in the past year, there’s enough evidence to prove that it’s not Todd. For starters, Jason has his own book, Red Hood: Outlaw (née and the Outlaws), and he’s just returned to Gotham to do his own thing. He’s also given Batman’s restrained methods a fresh sneer, repudiating the no-kill policy and Bruce’s worldview in general. But even setting that aside, the Arkham Knight’s critique of Batman is the opposite of Jason’s. 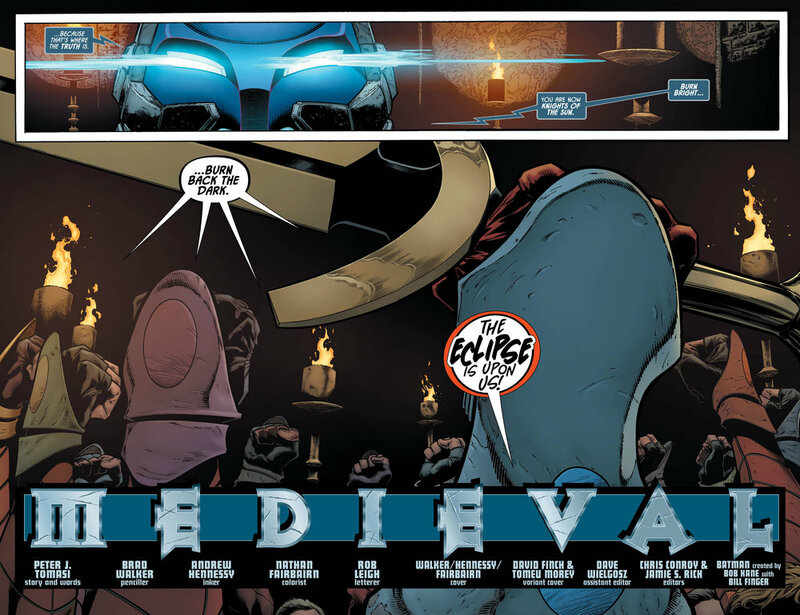 In Detective Comics #1000, the Knight specifically condemns Batman’s use of force as excessive. In Detective #1001, he positions himself as leading Gotham into the light, “into the blinding sun…where the truth is.” His viewpoint is clear: Batman is too dark, too violent, and the antidote to Batman is light. Not sure how he gets around his own use of violence, but that’s a topic for another day. The Arkham Knight can’t be Jason Todd, because he is nowhere close to Jason philosophically. It simply wouldn’t make sense. So who is the Arkham Knight? Thats the question we’re trying to answer! I’m hoping that Pete Tomasi, Brad Walker and crew will give us the clues we need to, at a minimum, make some educated guesses, so I’m going to start cataloguing the evidence here. If you notice something that we don’t have listed here, leave a comment or send us an email, and we’ll get it added. Yes, you might simply take this as some lofty speech, but there’s another clue on the page that suggests the opposite. Evidence: the Arkham Knight has green eyes…maybe? On the first page of Tomasi and Mahnke’s story in #1000, there is a frightened eye watching Batman as he beats the blood out of some unidentified criminal’s face. That eye is green. Now, the narration above and to the left of the eye says “through the eyes of others,” so there’s a pretty good chance that the Knight’s perspective in this scene is opposite the eye, from some distance away. That green eye is, as I said, clearly wide with fear. This does not necessarily mean that the Knight was a criminal at the time. It could simply mean that seeing the brutality of Batman up close was disturbing. And one of the few places a normal person might do that is Arkham. The Knight’s long speech in #1000, and his opening speech in #1001, are not characteristic of a street-level criminal. He speaks poetically—“stories told in whispers,” and “swallowed by shadows,” for example. His discussion of symbolism in #1001, and the line he draws between light and truth—these things suggest a learned mind. In #1000, the Knight—on several occasions—describes the antics of Batman’s enemies as cries for help. He points out—as he sees it—Batman’s lack of empathy. He says that Batman “seems to thrive on being the center of attention,” and implies that it is some psychosis—and not logical intent—that makes Batman so. He calls Batman delusional for failing to discern the Court of Owls. And then, on the third page from the end and the last page itself, the Knight plays word games—word association at first, followed by aural association, implying perhaps that Batman’s subconscious condemns him by taking on such a name, and such a mantle. And in #1001, the Knight says that the light is where the truth is. By implication, Batman is in the dark. The Knight has a loyal band of followers, all of whom are willing to take the fight to Batman, whose reputation precedes him. Such devotion could only be cultivated by a charismatic individual or some sort of mind control. Given his speaking ability, I’m leaning toward charisma. The Knight and his knights have a device that can generate an artificial sun. They have armor sophisticated enough to foil Batman’s attacks, weapons strong enough to penetrate his suit and cut his lines, and some as-yet unclear method of taking out thousands of bats in Gotham simultaneously. Clearly, the Knight has access to funding, either through his own personal wealth or through a benefactor. Rather than confront Batman himself, the Knight sends his minions in first, to corral the Bat and push him towards the Knight’s location. Only then does he emerge from the shadows and reveal himself. Have any other clues that you think we should add? Feel like we’re misinterpreting something? Leave a comment below, or email us to let us know.